With Wolf on shelves now, Tyler, the Creator stopped by the Late Show with David Letterman last night (April 4) to perform his solo tune "Rusty," along with Earl Sweatshirt and Domo Genesis. The performance found the trio trading off verses and performing some epically awkward, semi-synchronized dances. The censors blanked out plenty of words as Tyler laid into his critics and rapped about the many controversies surrounding him and his Odd Future crew. 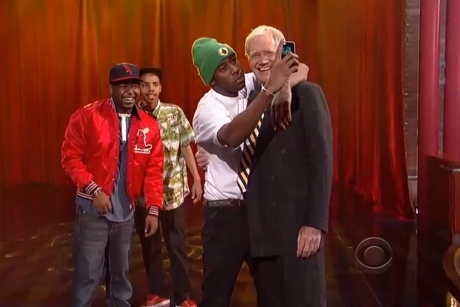 The rappers exited the stage immediately after the song, but eventually reemerged to shake hands with Letterman and Tyler took a selfie with the host (which you can see over at Instagram).